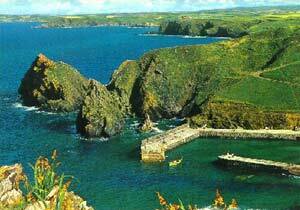 Mullion is the largest village on the Lizard and has shops, inns, cafes and restaurants, craft shops and art galleries. In the centre of the village, the 15th century church of St Mellanus is renowned for its richly-carved oak bench-ends depicting biblical scenes, including that of Jonah and the Whale. Mullion Cove has a pretty working harbour, protected from the winter gales that rage across Mount's Bay by two stout sea walls. 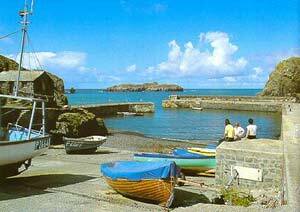 The harbour was completed in 1895 and financed by Lord Robartes of Lanhydrock as a recompense to the fishermen for several disastrous pilchard seasons. You can still see the old pilchard cellar and net store. There are plenty of smuggling tales too. In 1801, the King's Pardon was offered to any smuggler giving information on the Mullion musket men involved in a gunfight with the crew of HM Gun Vessel Hecate. The cove had a lifeboat station from 1867 -1909, and with good reason: in the six years up to 1873 there were nine wrecks under Mullion cliffs along a mile-and-a-half stretch of coastline. Inland are the remains of Wheal Unity copper mine, which operated from the early 18th century to 1919. A large copper boulder from the mine is in the Natural History Museum, London. Nearby Poldhu Cove is an ideal and easily accessible family beach. In December 1901, on the cliffs above Poldhu, Guglielmo Marconi conducted his famous experiment in trans-Atlantic radio communications. The beach at Polurrian, popular with surfers, is approached by an attractive walk along the cliffs or through a valley, and is well worth the effort. The National Seal Sanctuary is set in the picturesque Helford Estuary, by the beautiful village of Gweek, in Cornwall. The Sanctuary is a busy rescue centre, and also has resident Grey Seals, Californian and Patagonian Sea Lions, Goats, Ponies and Otters. 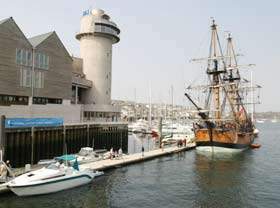 This unique maritime heritage is exhibited over three floors (in 12 state-of-the-art galleries), each focusing on different aspects of industry, work and communications. The National Maritime Museum Cornwall has been designed to create a wide appeal, offering a diverse range of 'hands-on' displays and an unrivalled collection of boats - including many in active use on the water.